Recently I learned that some people do not recognize Epiphany, and they do not put Magi (also called wise men) in their nativity decorations because the Magi might have been astrologers. The logic goes that since the Magi were astrologers or pagans, we should not honor them. We should not celebrate because they were not God-fearing people. I’ll be honest that when I first heard this argument, I was shocked. It seemed so strange to me. But, the more I’ve thought about it, the more concerned I have become by it. The footnote in my New Oxford Annotated Study Bible suggests that “magoi” were dignitaries or emissaries sent from kings of other nations to pay respect and homage to newly crowned kings. The presence of the Magi in the narrative about the young Jesus suggests that other nations of the world recognized the kingship of Jesus rather than Herod’s rule. It’s much like efforts countries in the world today take to minimize the leadership of dictators, the systematic practice of refusing to acknowledge leadership that took power from the people by force. But, even more than that, the presence of the Magi indicates from the very beginning God’s radically inclusive plan of salvation. Salvation was not just for one people group, one nationality, one group of religious elite. Salvation was something being made available even to the corners of the world. God’s plan of salvation was happening on a world stage, and not just a local one meant only for people who had done something to merit it. From the very beginning of the story about Jesus coming into the world, we meet a God who gives up glory and power to be near to humankind. January 6 is Epiphany (also called Three Kings Day and Twelfth Day**), and it is the day in the church year where we remember the visit of the Magi. Even though the religious leaders of Israel did not recognize the importance of the birth of Jesus, others did. And this recognition began something new. Epiphany isn’t the end of a journey; it is the beginning of one. Epiphany is the day where we recognize both the legitimacy of God’s kingdom over and above that of the kingdoms of the word, and that God’s plan includes the nations of the world. Epiphany is the first moment when the Gentiles begin flocking to see Jesus, and throughout the Gospels we see this theme repeated. God’s plan of salvation is broader, farther reaching, far more encompassing than anyone first thought. Perhaps it reaches still farther than we can imagine even today. 1. Epiphany reminds me that salvation isn’t just for people who are in the “elite.” God’s plan is so much bigger than anything I can imagine. Celebrating Epiphany reminds me to ask God to enlighten my eyes, to help me see the world God’s way. 2. Epiphany reminds me that Christmas is so much more than a one day celebration with expensive gifts and sugary foods. Christmas is a season, a time of celebration, a time of childlike wondering, a time of eager expectation because God is on the move in the world. Once December 25th comes and goes, the cultural craziness of Christmas ends, and an opportunity for deep, abiding reflection begins. I see Epiphany as an opportunity to reclaim the celebration of Christmas from the heavy cultural burdens we have placed on one specific date. 3. Epiphany commemorates the first-known indication that God’s love would be made available to the world, and not just one nationality. This is good news of great joy for all the people. Epiphany challenges any assumptions I might have for who God will accept and who God will reject. Epiphany reminds me that God’s plan is bigger than my plan. 4. Epiphany challenges me to be generous. The Magi brought gifts for Jesus. God’s grandeur and glory should propel me to bring gifts of worship, too. Perhaps this doesn’t mean offering gold, frankincense, and myrrh – or maybe it does – but I think it also means offering a cold cup of water to those who are thirsty, a place to warm up and find sanctuary from the cold to those who are without homes, sharing a meal, offering kindness, and showing love to those the world has taught us are on the fringes. I have a feeling that when we do this, we will experience the true meaning of Epiphany, and we will meet God in the places where we are. If you celebrate Epiphany, what are some reasons you have for doing so? If you’ve never celebrated Epiphany, why not? If you’ve never heard of it before today, will you give it a shot? I’d love to have a conversation with you in the comments! **Thanks to James Brumm for an important clarification in the comments. Epiphany is not the twelfth day of Christmas. That takes place on January 5. Some traditions will call the evening of January 5th into the morning of January 6th “Twelfth Night,” which can create some confusion. For a fuller explanation of the numbering of the days of Christmas, check out James’ insightful comment below. I have always left my Christmas decor up until after Epiphany. (Of course, one year I left it up til Easter, but that’s another story.) 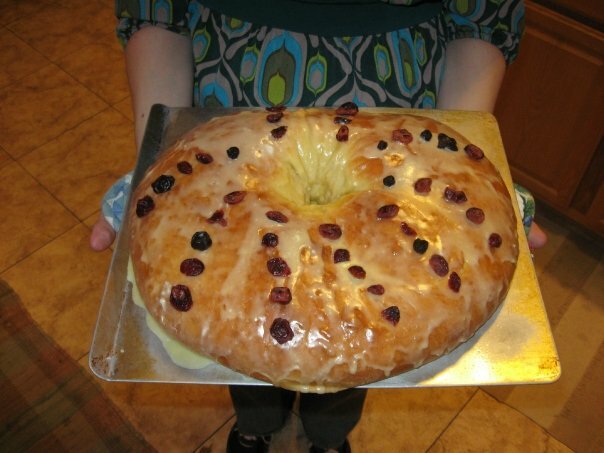 However, I’ve never baked anything special or done more to celebrate Epiphany. Perhaps I shall! Wonderful, Susan! If you did make anything today, let me know! We had our traditional cake, which was quite interesting as right after we had our cake, Dora the Explorer celebrated Three Kings Day on TV. Great talking point with my kids! I also celebrate Epiphany, and thought you stated the reasons eloquently. Two quibbles: first, yesterday was the twelfth day of Christmas–Epiphany is its own holiday (just the way Pentecost isn’t part of Easter, but grows out of it); second, while God’s plan of salvation may be bigger and broader than official Israel liked to acknowledge, Isaiah and others were trying to give people the hint for centuries. But it is, to me, a huge part of the importance of Epiphany, and a big part of the challenge of Epiphany for many Reformed folks, is the radical inclusivity of God. Reformed theology suggests–and, for some people, insists–that some people are excluded from the Kingdom. While I, like Calvin, am forced to acknowledge that is a possibility, God is never forced to do anything, and I think we need to be prepared to be surprised by how the inclusion and exclusion are being worked out. Amen to that, James! And thanks for your note about the official days/count of Christmas. It seems, from some research, that the night of Jan. 5 leading into Jan. 6 can be Twelfth Night, which leads to some confusion. But yes, Epiphany is its own day, and not part of the 12 days of Christmas. 🙂 I stand corrected. Oh yes, the prophets were ever hinting at God’s broader plan, and the people so often missed it. But God doesn’t relent. God’s radical inclusivity doesn’t relent even when we work so hard at exclusivity. Thanks be to God! This is a tangent but it has to do with faith. Seventh grade for me was very stressful as one would expect given how difficult the social environment is at that age. I had a semi-abusive computer teacher (this was a big, old, grumpy, yelly guy) who I got a ribbing from the first day of computer class. All the Apple IIe’s had the standard home screens.. except the computer I was sitting at. It was running some educational game. So in front of all those peers he kept barking at me, asking me why I wasn’t on the home screen. It was like he couldn’t believe I wasn’t there. I bring this up to paint the picture of how I feel emotionally about people trying to get me to be Christian. I see something totally different than everybody else on my screen. Trying to think logically about the faith, my experiences of God, and experiences of God’s people have brought me to different conclusions than those around me. And those around me can’t understand, they keep saying, “pray, read your Bible, and go to church”. And you ask, who (especially someone that has fallen as far as me) wouldn’t want hope, joy, peace, and other fruits of religion? But for me (and a lot of other people) we cannot just magically will our way into this. There has to be cogent thought processes and experiences that lead one places. If those are not in place one can force themselves to have faith but once one lets up it will go away (similarly how when removed from old Soviet brainwashing people recovered quickly). First, intercision, thank you for your comment. Not a tangent at all, but a real-life illustration about how we sometimes refuse to accept differences. I pray that God would reveal himself and faith to you in a language you can understand. For now, know this: Jesus loves you. And because he made you, he knows your most fluent spiritual language. This post reminds me of a conversation I had just this morning with my chiropractor. She’s been turned off to Christianity precisely because of the people we’ve excluded, and how we say, “faith must be THIS way.” She went in a universalist direction, but I did tell her I think Jesus is the most important person. And belief in him is the only way to go. But, the outworking of that belief, the living out of our salvation, exists on a wide spectrum. I hope it makes her think, and I hope God brings these conversations up again, so that I can explain why Jesus is the only way. But it was awesome. Thank you, intercision, for sharing, and Jill for connecting it, too. When we are so exclusive and bring about so much pain for others, is it any wonder when they react and want to include wantonly and without any structure at all? When we set the bounds so tightly, and injure so many people along the way, the pendulum is bound to swing back the other way with violent force. This year, my word for the year is “love,” and I’m trying to allow that word to bring me to a posture of humility so that I’m always willing to learn from others. It’s not that there isn’t a TRUTH somewhere, but everyone has something to teach me. I just need to be willing to learn…and perhaps that will enable me to see that I have a far too narrow view of God. This Year I have been drawn to the foreignness of the magi. I actually WANT them to be magic-conjuring, star-consulting “pagans.” It seems to me that if I consider them “ambassadors” from high and mighty kings, something of the story is lost. God woos weirdos and magicians and makes them heralds of the Way. As God wooed the magi-from-afar, God woos me, a gentile-foreigner-baptist (of all things). That’s what I’m learning this Epiphany. God’s gracious love, indeed, reaches farther than I am comfortable. How about that. Leanna – I love that! “God woos weirdos and magicians and makes them heralds of the Way.” Yes, yes, yes. No more beautiful story than this! Thanks! Please please, recipe for your cake? Thank you! This makes two HUGE cakes. I usually make the full recipe and share one at church, but if you’d like just one, I’d recommend cutting the recipe in half. Enjoy! April, does your cake in the photo have the frosting? Was thinking of cutting the sugar down in the frosting side (when I just now read the recipe). What did you use to make the cool spiral design (raisins?)? Thanks! It has a glaze on the top, and that could absolutely be reduced or cut down on. It is mostly to help the fruits stick. 🙂 You can use any candied fruits, but I used raisins and dried cranberries. I have a tattoo on my foot based on a sermon I heard on Jan. 6. It says “Love is epiphany”….meaning Christ (love) is making himself known to the gentile world. Or as you put it “Epiphany challenges any assumptions I might have for who God will accept and who he will reject.” I love that God is writing every story and part of that is his work in drawing all kinds of people to himself. I love that! “Love is epiphany.” What a fantastic reminder!